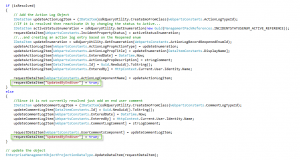 Both of those two blogposts is built around changing the status of the incident to be able to trigger a notification to the assigned user of the incident to react upon. There is nothing wrong with that, it works pretty good in fact, but there is one flaw in this design. 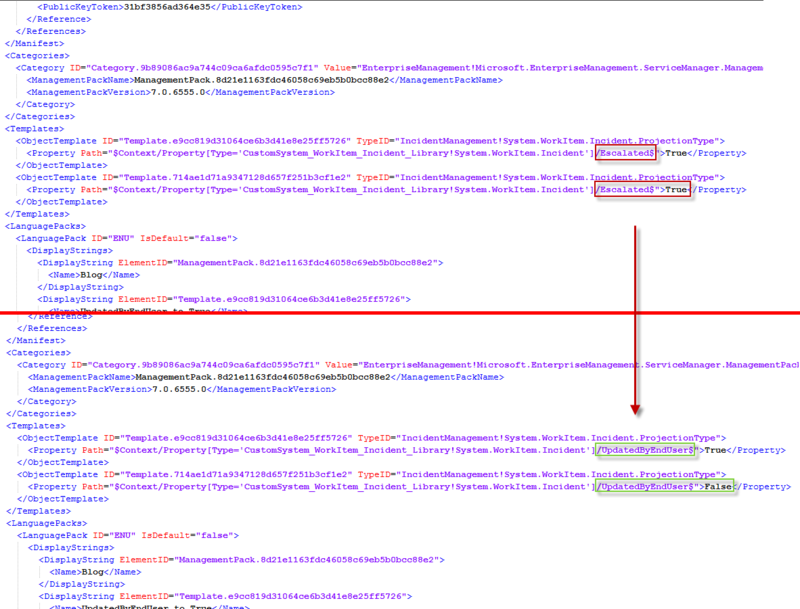 This flaw is related to the way the Exchange connector works and the fact that we are applying a template to the incident to set the status back to active (for those of you who doesn’t know what I’m talking about, please see http://www.scsm.se/?p=167). What if someone replies to an e-mail of an incident which has been closed? Well, based upon the configuration we did in the earlier blogpost mentioned above, the exchange connector will apply a template that sets the status back to active and the incident is re-opened. For some this might be acceptable, but for others, it’s not. I visited a customer a couple of days ago who thought this was great if the status of the incident was set to Resolved but not if it was Closed. Instead, they wanted to notify the end user that he or she would have to open a new incident and leave the old incident closed. There is no way to tell the Exchange connector to apply different templates depending on the current status of an incident, so I had to figure out another way to solve it. Since I couldn’t use the status of an incident to trigger the notifications, I figured we would have to add a new propery to work with instead. 1. Extend the Incident class with a new boolean property. I will call my property “UpdatedByEndUser”. 2. Create two incident templates – One who sets “UpdatedByEndUser” to True, and another who sets “UpdatedByEndUser” to False. 3. 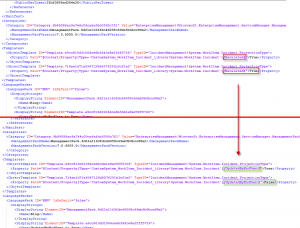 Edit the Exchange connector to apply the UpdatedByEndUser to True template when an incident is updated. 4. Edit the source code of the Self Service Portal to set this value to True if someones uses the portal to add a comment to their incident. Open the source code for your SSP (http://www.scsm.se/?p=398). Then open the “Helper.cs” under WebParts and search for “//If it is resolved then reactivate it by changing the status to Active… ” – this should bring you to line 510. Note: This is the untouched code. 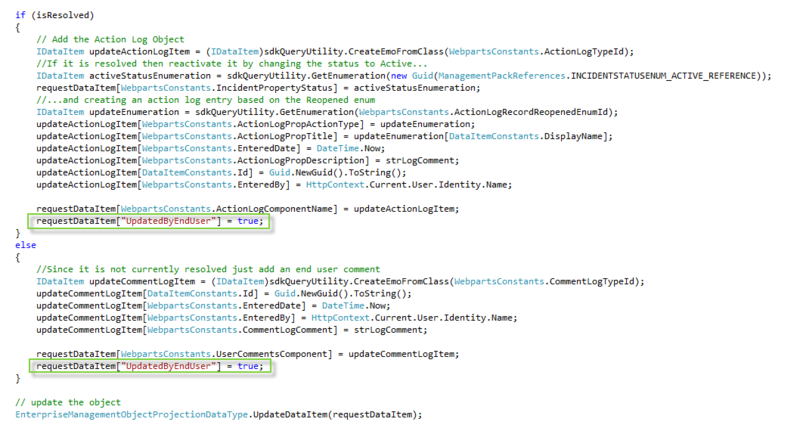 If you followed the blogpost “Minor SSP modifications, part 4 – Changing status of an incident when updated by the End user” the code should like a little bit different and you might want to revert that change. Both these workflows would then send an e-mail to the assigned user to inform he/she that the incident has been updated, but they must also apply an template that sets the value of UpdatedByEndUser back to False; otherwise the workflows won’t trigger on recurring updates. To do this, open up your Source Code for the SSP again. The Close Request button is actually available on two pages: ViewAllRequests and RequestDetails, but both of these buttons uses a function called “CloseIncidentInternal”, so what we need to do is edit that particular function. This function is located in the Helper.cs file, so let’s open that file. Compile and deploy the new binaries. 7. Create another workflow that triggers when UpdatedByEndUser changes from False to True and where the status equals closed. Use this workflow to notify the assigned analyst that the end user has closed his/hers incident. Thanks alot for this post, I find it very interesting. I have just begun to configure SCSM 2010 SP1 and have done pretty good so far. Implemented the Send Mail task effectively and have some working workflows. Now when I try to implement what you have posted above here, I already get stuck at “1. Extend the Incident class with a new boolean property. I will call my property “UpdatedByEndUser”. When I go to that blogpost for help I get even more lost. I feel that I have too few knowledge to succesfully implement this without some pointers. Tried to solve that by following the solutions mentioned, but also there I get stuck as I can’t get my head around the template i need to store into another MP?? it’s mentioned in the last post of that chain. Hopefully you have the time and the will to point me in the right direction. As it sounds like you haven’t done any class extensions to the incident class before, you should create a new management pack within the authoring tool to store this in. Thank you for your tip !It helped me a lot 🙂 I am nearly done with setting everything up. I’ve done everything you mentioned in the blog. Have tried many changes but nothing works? Also, when I close the incident from the portal, the Closed workflow is not triggered at all.. it triggers another workflow I made that sends out an email to the affected user when a ticket status changes from active/pending/updated to closed. is there a way to solve this problem using the built-in functionality SCSM 2012? Testing functionality SCSM2012RC we did not find this feature. This can be solved in 2012 in a similar way – Stefan is going to write a blogpost about that. Give him a couple of days and he should have it published! Any news on this as yet? This would be great for SCSM 2012. Would love to have this in place. I was wondering if you can advise a way for me to notify the Affected User and their supervisor when their case has been resolved.